Embroiled in a series of committee meetings, we witness a group of ten discordant villagers prepare a pageant based on a somewhat vague event, and the knives are out almost from the off. The event is dreamt up by a handful of people hoping to re-enact ‘The Massacre of the Pendon Twelve,’ an alleged group of 18th century tax reform radicals put down by the army. All the action takes place in a seedy hotel ballroom, where the pageant committee meet. 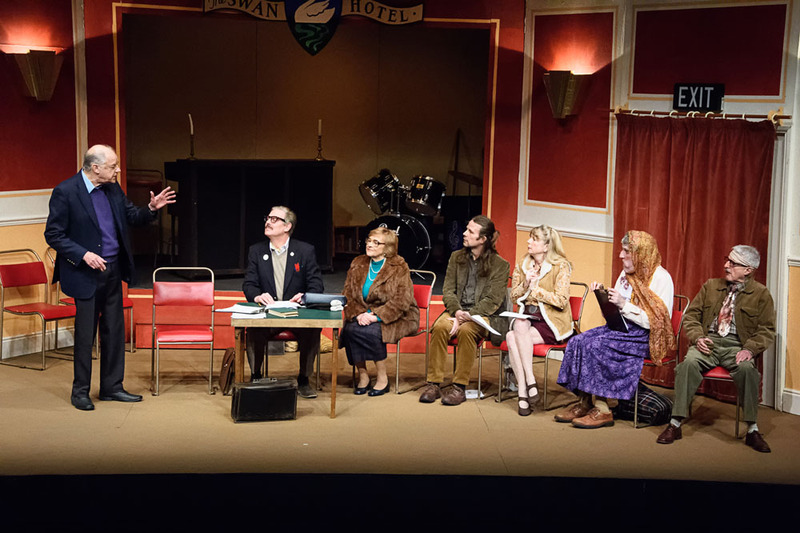 The play follows their riotous deliberations and, leading up to a chaotic final scene on Pageant Day itself, we witness characters with traits and lines that will be familiar to anyone who has served on a committee. 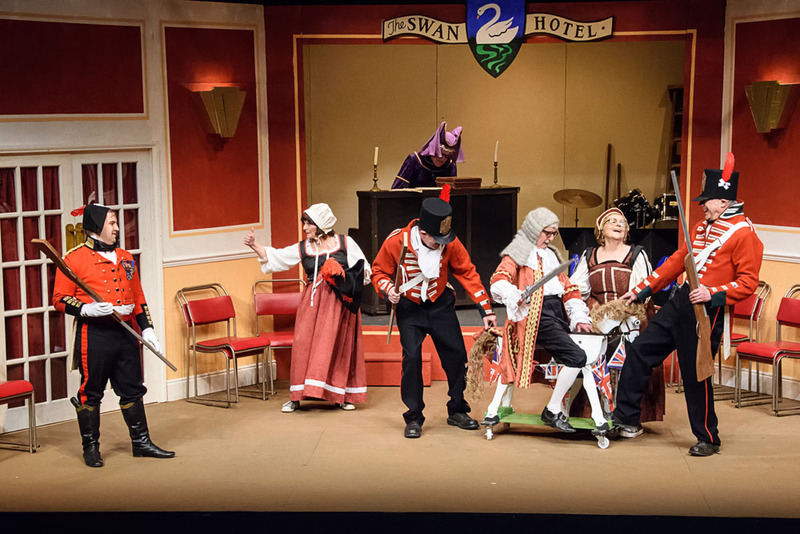 Join Maskers for a hilarious portrayal of war in the corridors of small town England which might just lead Pendon to a fête worse than death. The prominence of the use of red was a sign of things to come as the more gentle first act of three meetings descended into the eventual farce and carnage of the second. 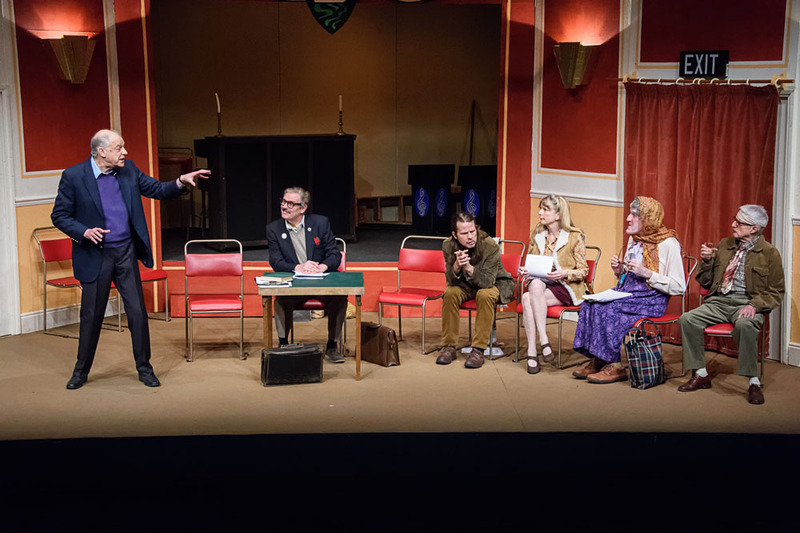 Anyone who has served on a committee will find much to recognise and enjoy here in the troupe of Ayckbourn's clichéd characters delivering the acerbic one-liners. Ken Hann does well as the archetypal bumbling chairman ‘elected’ by his harsh-tongued conservative wife (Christine Baker), who really comes into her own at the end of act one. This is not just a series of taunts and put-downs but a real character riding into battle against the perceived Trotsky-ite machinations of a dismissive William Baggs as he tries to hijack the Pageant for his own opposite political ends. Their ‘committee’ exchanges are most enjoyable for being suitably rude and pointed. Angie Stansbridge and Marie Mcdade coo and flutter around him in bohemian contrast to the more moral and staunchly upright of the group, as the Pageant descends into a real battleground for ideological supremacy. Philip De Grouchy brings pathos to the man more interested in the bottle than his wife (whom we never meet as they attend alternate meetings) while John Hamon and David Jobson as hotel caretakers expertly move the props around between and within the acts, causing just the right amount of mayhem to the proceedings when needed. Peter Ward grabs the start of the second half and never lets it go, as the farcical results of act one are played out for all to see. 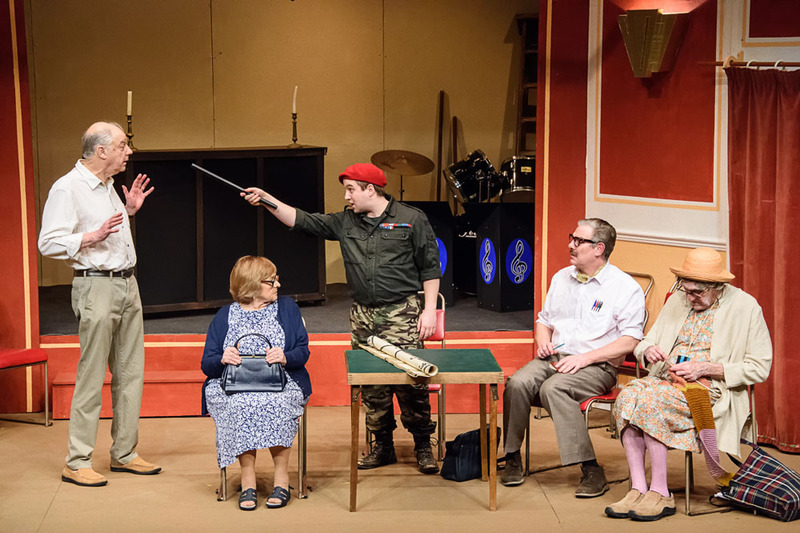 His performance propels the audience into much laughter and sets the scene for a final physical war between the differing ideals – all being terribly British, of course. Nick Longland and John Souter (who plays his mother – yes, you read that correctly) are the perfect double-act: the former in ‘counsellor’ character throughout, a serial committee attendee, always finding fault with proceedings and spelling; the latter causing much amusement throughout, savouring and making the most of every line and moment as the typical hard-of-hearing older lady secretary who never quite gets the minutes typed in time but produces mince pies and knitting from nowhere, it seems. The concentrated piano-playing in the second half while all is let loose around her is particularly well done. 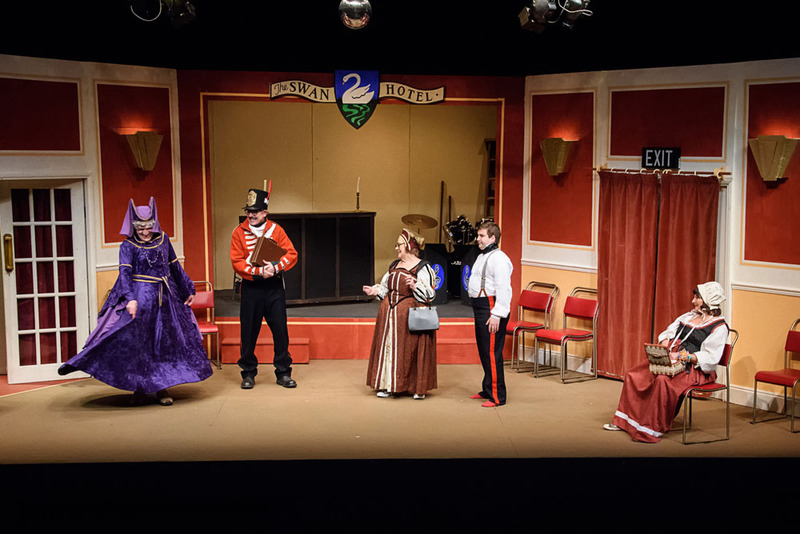 The Maskers Group prove again that they choose the right material for their actors, and the packed house applauded at the end very enthusiastically. I think it’s fair to say that this isn’t one of Ayckbourn’s finest. It lacks the intricacy of language and character that one expects; that said, its gentle humour is endearing, as the committee from hell (aren’t they all?) organise a pageant based on an obscure piece of village history. 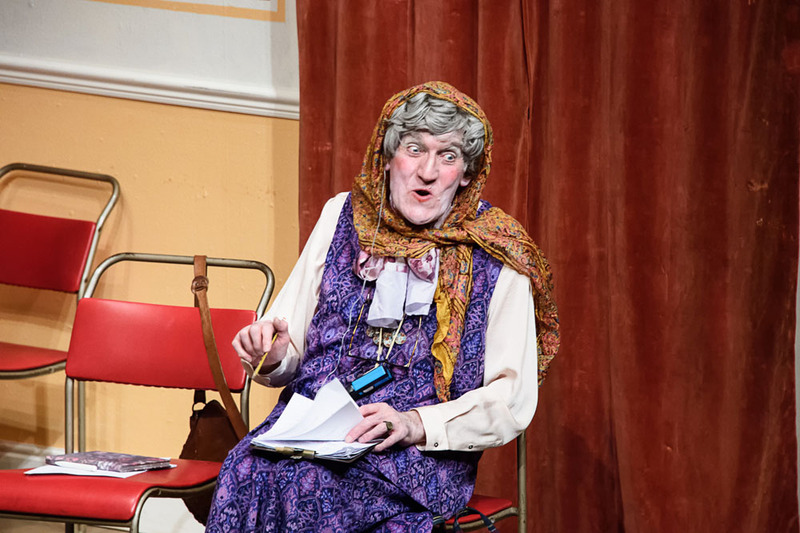 Ray (Ken Hann) does his best to fairly chair the impossible personalities; the worst being his bigoted and vocal wife, Helen (Christine Baker), whose condescending and outrageous observations are deliciously cringe worthy. 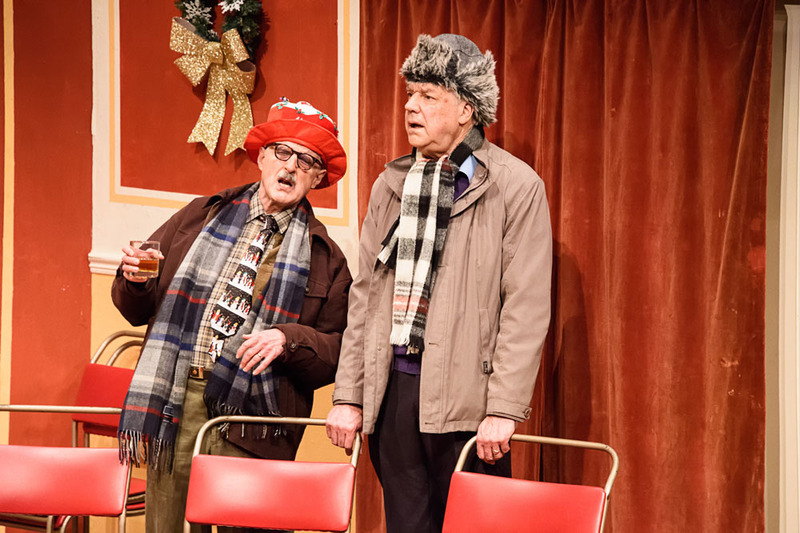 The side is supported by the supercilious deputy, Donald (Nick Longland) and the inebriated Lawrence (Philip de Grouchy) who gives a spirituous performance. The stand out performance comes from Audrey (John Souter), Donald’s aging mother, with few lines but always in character and a joy to watch. 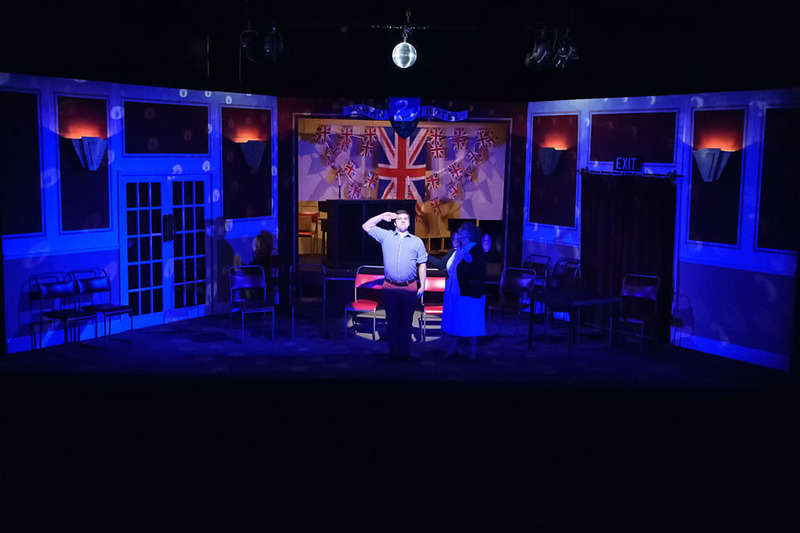 The first half drags at times but proceedings pick up in the second act as Captain Barton (Peter Ward) bursts onto the stage. The play is enhanced by a static but decent set and some well thought out props and costumes. Alan Ayckbourn has written 79 plays to date. Ten Times Table was written during the 1970s when Ayckbourn was at the top of his playwriting career. This is a much gentler comedy than many of his plays written during the same period. 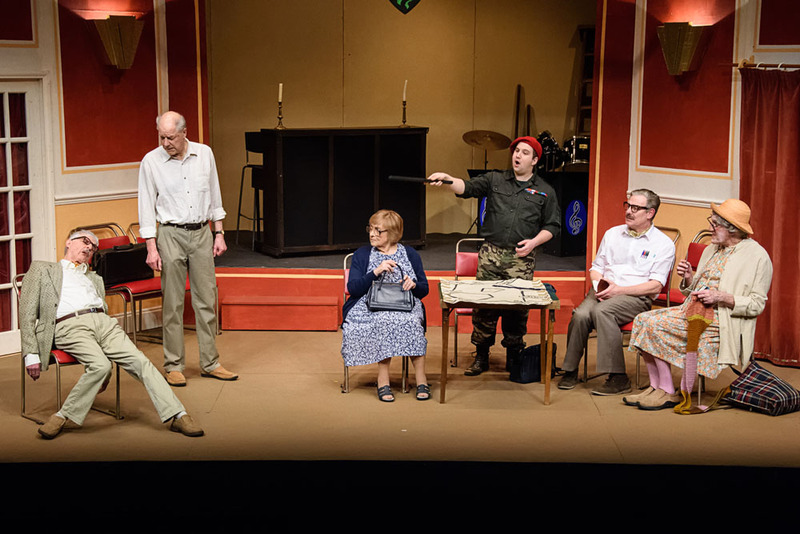 Although the end of the play switches from comedy to farce it nevertheless still bears many of Ayckbourn’s hallmarks, sharp observation of human nature and the weaknesses and quirkiness of ordinary people. He directed the play’s first outing in his hometown of Scarborough and in the round. There is a laugh on almost every line as we watch this group plan a pageant while gently throttling one another, each thinking that they have the right to lead, while others sit back quietly and get on with the job. Hazel has been a Masker since the early 70s, performing in a wide range of roles all the while gathering experience. In the Spring of 2011 she took up the role of director with her first full length production of the comedy Ladies Day and enjoyed every minute. 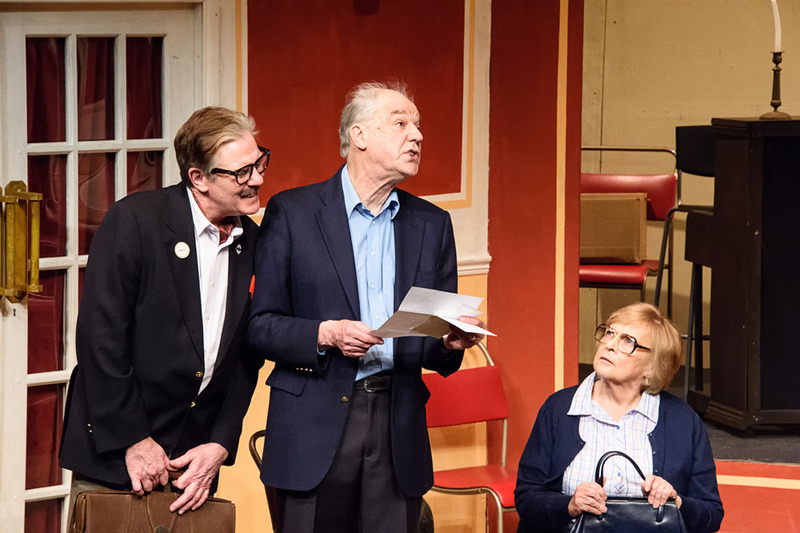 Soon after, she decided to take on the Nuffield Theatre with another comedy, Sitting Pretty, written by Amy Rosenthal - daughter of Maureen Lipman. We were thrilled to have Amy come along and see the show; she thought that this was as good as any professional production. 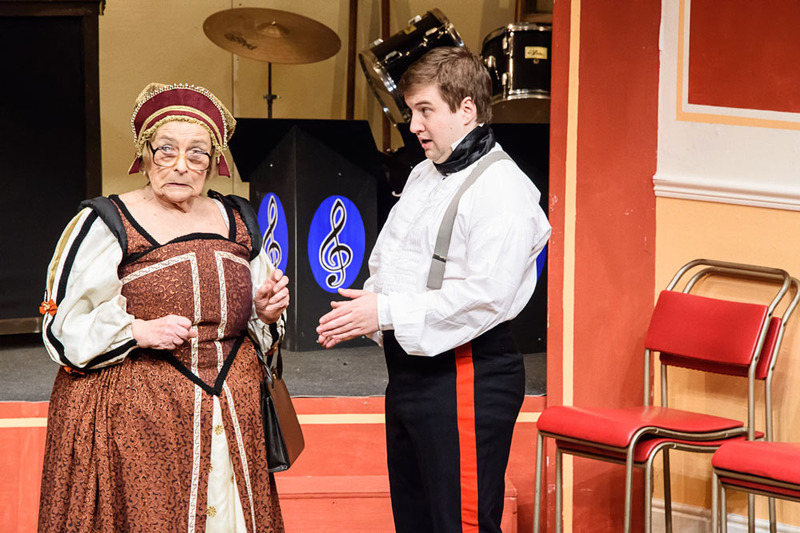 This gave Hazel an enormous boost to direct another play by the ever-popular Alan Ayckbourn, a piece about real people we can all identify with. She says, "I am very fortunate indeed to be able to have the opportunity of directing within such a talented company. We’ve laughed a lot in rehearsal as I know you will in performance. Sit back and feel cosy while winter blows outside, and allow this wonderful cast to tickle you pink!" Ken first appeared at the Nuffield for Maskers in 1970 as a character named Vermin, which says it all really. Over the years he has gathered a fair number of vicars, stiff upper-lip Englishmen, and Regency fops to his repertoire. 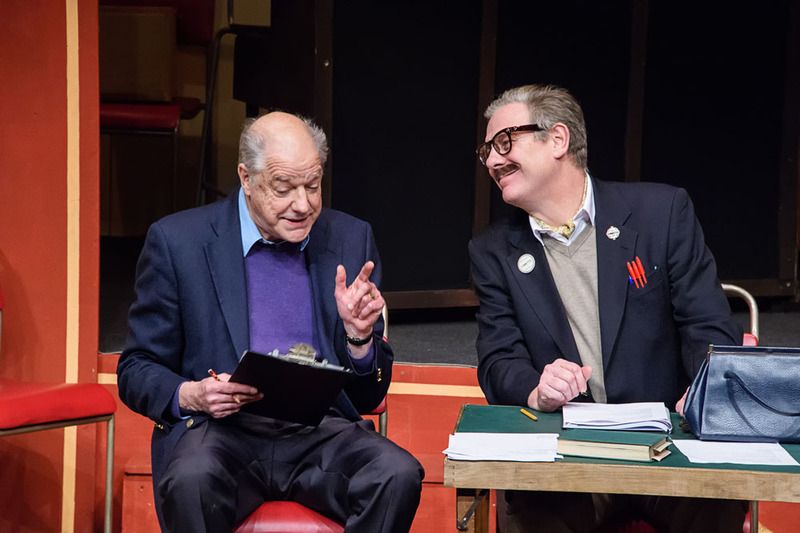 Having had the privilege of directing four plays at the Nuffield, including King Lear and Uncle Vanya, Ken is looking forward to acting in his third Ayckbourn. Chris Baker has been a member of Maskers since the 1970s. She was last on stage playing an aged mouse in Can You Hear The Music, for which she won a Daily Echo Curtain Call Award. Chris serves on the Maskers Committee and hopes that the Pendon Pageant committee bears little resemblance. Tonight marks Nick's debut performance with Maskers as one of our newer members. 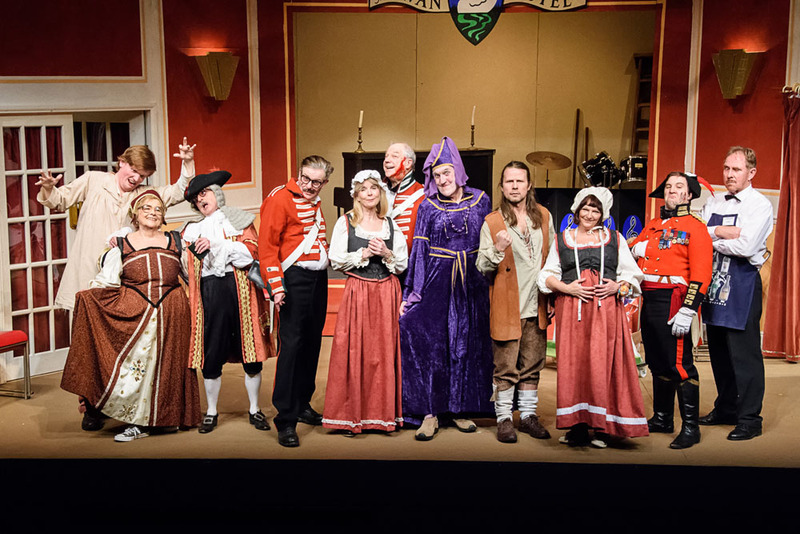 No stranger to the stage, having been a member of RAODS for a number of years, Nick has featured in a variety of shows including Jack The Ripper at both the Plaza and the Minack theatre. He won the 2014 Curtain Call Award for Best Actor in a Comedy for his role in Private Lives. 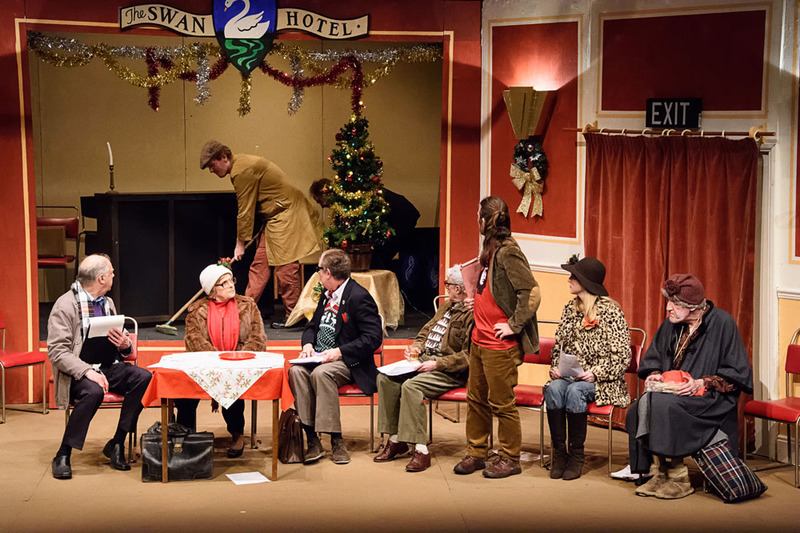 This will be Nick's second Alan Ayckbourn play; he is looking forward to performing on the Nuffield stage for the first time and very much hopes you enjoy tonight's show as much as he has enjoyed being a part of it. 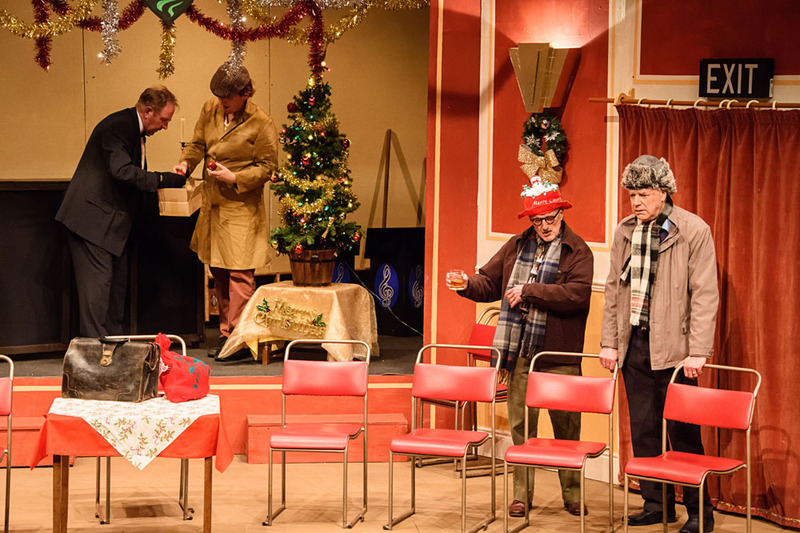 John has performed with Maskers for many years in various roles both serious and comic, but this will be his first Alan Ayckbourn play. Having had many challenges on the Nuffield stage, including King Lear, he now faces what will be his greatest and one that demands his ultimate personal sacrifice; to appear before his public in a frock and bare-faced! 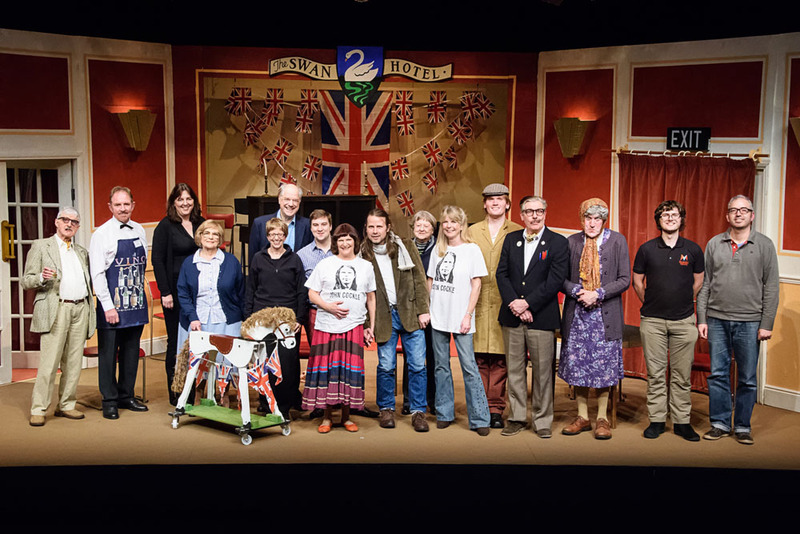 This is the second time William has performed with Maskers at the Nuffield Theatre. His first visit was in Sitting Pretty in 2014 playing an art teacher. This time it's a modern history teacher, Eric. Eric also happens to be a Marxist! William has never played a Marxist before but it's a lot of fun getting hot under the collar and insulting the other characters. In his last role as Shere Khan in The Jungle Book, William almost got to eat the other characters! Returning to the Nuffield will be a real pleasure as it's a great team and a funny play. 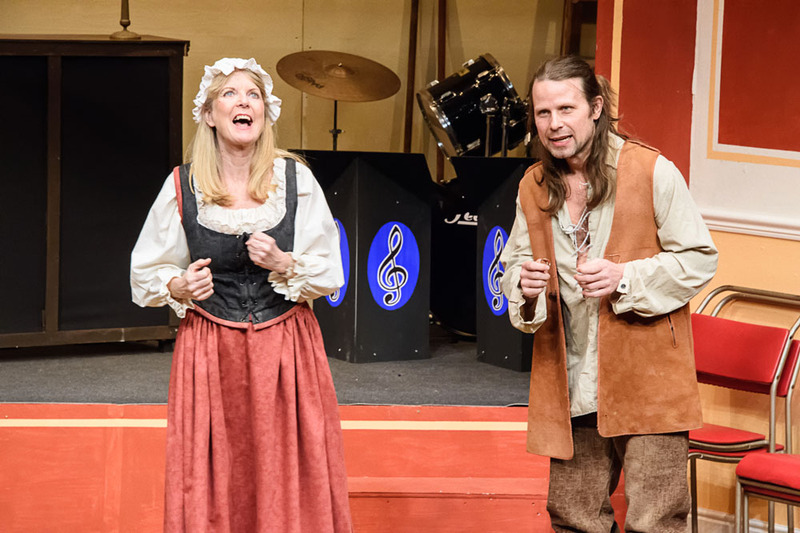 Angela has been a member of Maskers since 1973 and has enjoyed playing a range of parts at the Maskers Studio, The Nuffield Theatre and in the open air summer productions. She is rarely seen without bundles of publicity flyers as she is part of the hard working marketing team. This means that working on the character of Philippa, who is quiet with little to say and an inability to be heard, has been a challenge!! Peter, or Peewee as he is generally known, is a recent engineering graduate, originally from North East England. Quite how he ended up going into theatre, therefore, is a mystery to many people, including himself. Perhaps he got a bit overzealous when watching an Alan Bennett play. Whatever the reason, Peewee is now a regular performer with several companies in the local area with aspirations to go professional in the near future. Recent credits include Officer Barrel in Stickman Productions' Urinetown and Aumerle in Richard II with Maskers. Marie joined Maskers in 2011 and has had the good fortune to be cast in roles ranging from tragic Shakespeare widow to jungle-dwelling panther, via various other eccentric alcoholics and academics. The opportunity to help bring Ayckbourn to the Nuffield stage is one she could not pass up, not least as it was the best excuse ever to haunt all the charity shops in Hampshire for 70’s gear... Fab! 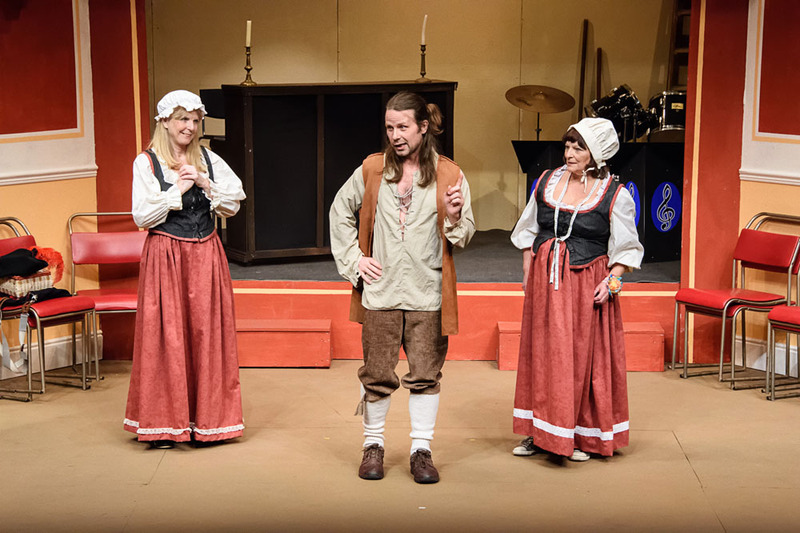 Philip has been strutting the Southampton stage for more years than he or anyone else can remember, playing a wide variety of roles, from Shakespeare to G&S opera. His current demanding role of Lawrence Adamson luckily provides frequent opportunities for rest and recuperation between drinking and sleeping, so he should last out till curtain-call. You are requested not to applaud too loudly while he is asleep. From John's early days of appearing as a huntsman in The Royal Ballet's Swan Lake and a leading role in the British premier of Cesti's opera The Chaste Love of Orontea to the present day and being on stage at the Nuffield in Ten Times Table as...a caretaker! What does he say about that you may ask? Well nothing really, as it is a non-speaking part for him! Having performed in Richard II and strutted around as Buldeo in The Jungle Book, David is taking a step back into a silent role for this production. A step up, perhaps, from the time he played a lobotomised patient in One Flew Over the Cuckoo’s Nest, standing at the back with arms up in the crucifixion pose, saying “**** em all” a few times! Still, he made his presence felt by the end, and hopes to do the same here.